I couldn’t stand the sight of my small fabric collection folded up and piled up on the shelves any longer. Fancy glass doors are on my wish list for these cabinets but until then I needed an organizing solution. I obviously don’t have endless yards of fabric requiring large bolts like the ones at the fabric store. 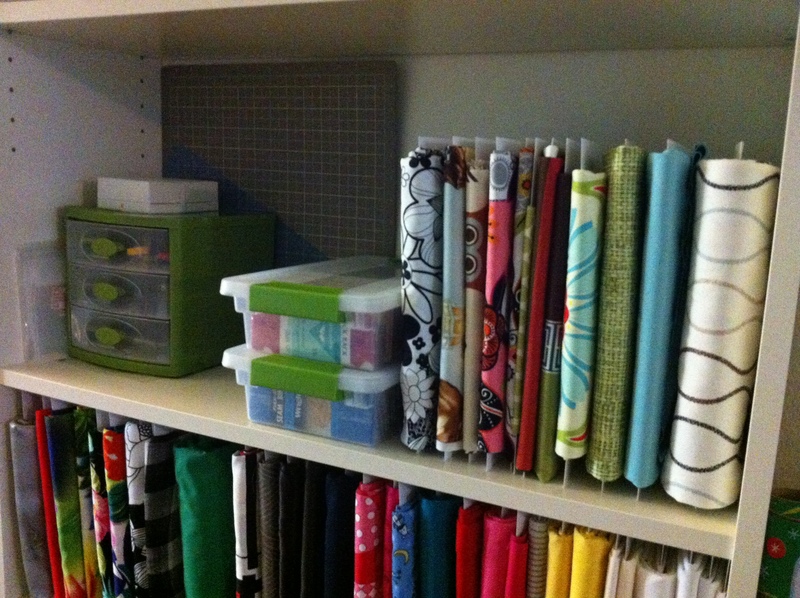 I found the perfect solution for the small fabric collector…. comic book boards. Yes, the cardboard sheets made to slide into comic book sleeves. They are available in various sizes and are inexpensive. I purchased my pack of 100 6 x 10 on Amazon for less than $10! They were perfect to fold my small portions of fabric over. Now my fabric is displayed neatly and I can actually see what I have to work with.